A dessert consisting of a layer of sponge cake topped by a thick slab of ice cream and/or sorbet, all of which is blanketed with meringue. This creation is then baked in a very hot oven (or placed under the broiler or grill) for about 5 minutes, or until the surface is golden brown. The meringue layer insulates the ice cream and prevents it from melting. This is a "spectacular" dessert, both pleasing to the eye and the palette. Serve this beautiful dessert for a very special occasion or celebration. It will be remembered for years to come that you made this especially for those very important people in your life. Preheat oven to 350 degrees F/180 degrees C. Grease and flour a 9-inch round cake pan. Place the butter and sugar into bowl of an electric mixer fitted with the paddle attachment, and cream together until very light and fluffy. Add the eggs one at a time, beating well after each addition. In a medium mixing bowl sift together flour, baking powder, and salt. In a small bowl, mix the milk and almond extract. Slowly beat the flour mixture into the butter/egg mixture, alternating with the milk/almond extract mixture. Spread the batter evenly in the prepared pan and bake for 25 to 30 minutes, or until the top is golden. Turn cake out onto a wire rack to cool completely. When cake has cooled completely, spread a layer of softened ice cream over it, followed by the softened sorbet, shaping it into a dome. Place on a plate and freeze for 2 hours, or until the ice cream is hard. In a small saucepan, stir together the sugar and water. Bring to a boil. When the sugar syrup reaches 236 degrees F/113 degrees C on a candy thermometer, remove from the heat and pour into a glass measuring cup. Place the egg whites in the bowl of an electric mixer fitted with the whisk attachment, and whip until foamy. Add the cream of tartar, and beat until stiff. Whip the sugar syrup into the egg whites slowly and carefully, and continue to whip on high for 2 to 3 minutes, until the egg whites have cooled. 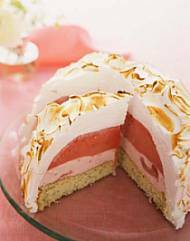 Cover the cake base and ice cream with a thick layer of meringue, swirling it with the back of a spoon to form decorative peaks. Place under a preheated broiler to brown (it will do so almost instantly), or use a blow torch to brown the meringue. Cut into 6 wedges and serve immediately.